Aquarius March 2018 Horoscope foretells that professional life, improving personality and building up ideal friendships will dominate your life in March 2018. Majority of the planets have shifted from the northern half of the horoscope to the southern half this month. Hence Aquarius personality will be concentrating on emotional deficiencies and family obligations this month. Emotional stability will also help your career prospects and worldly success. Planetary power is located in the eastern half of the chart in March 2018. Independence and aggression will dominate your life. There is no dependence on social skills or adaptability to people and situations. You do whatever you want and others have to obey and follow your path. Uranus and Jupiter are favourable for people involved in academics like students, and people in creative fields such as marketing personnel, teachers and journalists. March 2018 Aquarius monthly forecasts predict that professional goals can be achieved by being emotionally stable this month. About 80 per cent of the planets are in forward motion and will help you to accomplish your goals quickly. 2018 horoscope predictions foretell that monetary situation will be under scrutiny this month. Earnings can be improved by sound fiscal management. Your partner will be busy with personal problems and Aquarius zodiac sign cannot expect any support from the partner in financial matters. More than 50 per cent of the planets are in the House of Money and hence you will have a large number of financial opportunities from various sources. You can get into new financial ventures or partnerships. You will get money through inheritances or with promotions in your job. March zodiac monthly horoscope 2018 predicts that relationship with your spouse or partner is a bit sedate this month.There is a need for more romance and passion in love life. The relationship is under rough weather during the early part of the month. This can be repaired by mutual discussion and some amount of compromise is necessary on both sides. After the 21st, Aquarius compatibility returns to normalcy and there is plenty of romance and physical love. Singles will have very good opportunities to get into romantic alliances after the 21st. Love is to be found in the nearby locality among known people in March 2018. There will be lot of dynamism and enthusiasm in the new relationships. Plenty of socialising and partying will follow for Aquarius born. Love happens all of a sudden, but will be steady. Aquarius sexuality may find romance while pursuing your financial objectives or in academic environment. Marriages of siblings will be under trial this month. Aquarius horoscope for March 2018 is forecasting that health will be wonderful after the 21st. Take carre during the Mercury Retrograde 2018. 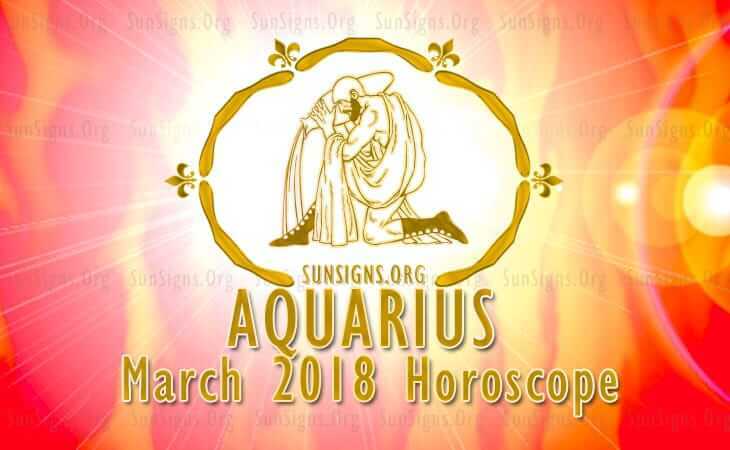 To sum up, professional goals and health will be superb as per Aquarius March 2018 horoscope. Relationships and monetary prospects are not that exciting. See Numerology Horoscope 2018.